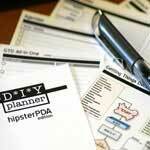 Geek worlds collide as Douglas Johnston releases the “Hipster PDA” edition of his popular D*I*Y Planner. As with the classic version, Douglas has adapted and refined popular “paper planner” templates—only this time they’re tailored to fit on our beloved index cards. To commemorate this august occasion, we’ve asked Douglas himself to share his thoughts on why paper seems to be making such a comeback (if it ever “went away”), including some insights into who this format may and may not work best for. Great work all around, Douglas! In this day and age, paper-based planning (PBP) is a notion roughly analogous to horse-and-buggies, pneumatic networking, sliderules, and steam-powered lawnmowers — in other words, ancient technology. So, why are we suddenly seeing a resurgence in paper-based organizational tools like planners, index card sets (a.k.a., the Hipster PDA), file folders, pocket briefcases, and honest-to-goodness real-ink pens? Outside of a number of philosophical reasons, I believe that it's ultimately a matter of knowing that these things actually work. After all, not even the trendiest tools last for more than a season if they don't deliver (and I have a junk drawer overflowing with orphaned gadgets to prove it). There's a proven track record behind paper-based planning, and an endless array of options for those people wanting to define --and redefine-- their systems. Despite being an IT professional, I've found that the dozens of technology-based systems I've used over the years have never really been fully effective solutions for managing my time and projects, and so bits and pieces of my life are now scattered in a hundred incompatible systems, never to be seen again. The last straw was when several of my Palm databases became badly corrupted last year, the bad data having also spread to the desktop and the backups: needless to say, much was lost. I began to wonder if the Day Runner I used a lifetime ago could be resurrected and made useful again. This plan had its problems, however: not only was the nearest Staples a four-hour jaunt away, but their shrink-wrapped forms were quite limited in variety and usage, not to mention very expensive -- a typical pack of 20 To Do sheets was about $5 USD. The D*I*Y Planner project was thus born as a way of providing a wide assortment of forms at little cost. (Although, my wife might argue that I was just being cheap.) With the realization that others might find it useful, I decided to create a system that could be tweaked to suit almost any methodology or situation, relying heavily upon user feedback for ideas and direction. The latest member of the D*I*Y Planner family is the Hipster PDA Edition, a set of 34 organizational and planning templates designed specifically for 3x5“ index cards. I've received hundreds of requests for a kit like this, many claiming it was an important option for creating an ideal customized system. At first, the demand took me by surprise; after all, why would you want to print so tiny on cards that contain so little information and are so hard to file? The past few weeks, I've been experimenting with the Hipster PDA and the cards that people have asked me to create, and I now admit my initial impressions were born of ignorance. So why do these work? Although I've never minded hauling my planner around, sometimes the “weight-to-usefulness” ratio is a little low. It's far more sensible to take a grocery list on a card to the supermarket than your entire project portfolio, for example. A pack with a few GTD All-In-One cards, a few Notes cards, and two months' worth of calendars is a great way to be portable. The most important info for the day can be written on them before you hit the road. I have about 200-300 pages in my Day Runner, most of which aren't of immediate importance. In contrast, the Hipster PDA emphasis is upon short-term planning and productivity, which means that you don't have to carry around the next six months of materials, only the basics you need for the day or week; this essentially forces me to focus on getting things done now. This fits quite well with the immediacy of the GTD philosophy. Even if you use a regular paper planner or software like Outlook/Entourage, DEVONthink, Tinderbox or wikis, these cards make great scratch pads for moving information into a more permanent solution later. I've started hauling around a Hipster PDA during the day as I go about my business, and then settling down with my regular “classic” kit in the evenings, transferring and processing the most important details. I then review my projects, calendar, actions and references as normal, and jot info onto the cards for the next day. To keep your mojo rising, I've also included two quick-reference cards: one being a Getting Things Done flow chart, brain tickler, and weekly review list; the other based on Covey's First Things First, a little cheat sheet for weekly planning, daily work, and reviewing. Filing isn't quite as easy as with regular paper. The thickness and size of the cards make permanent storage a little problematic. True, you can keep lots of index card storage boxes or bulky envelopes, but this is clunky compared to a typical file cabinet with folders designed for larger, thinner paper. If filing is a necessity for you, then you might think about transferring your information to another medium. It seems like 30 cards is a ”sweet spot“ in terms of toting the Hipster PDA around and shuffling for data. This is great if you just carry a calendar, some action lists, some notes, a few project sheets, and a bunch of blank cards or forms. If you want more —like numerous reference lists, full project details, a year's worth of monthly calendars (or a month's worth of daily calendars), and so on— then the deck becomes unwieldy and tends to make finding information difficult, even with tabs or dividers (which, again, increase the thickness). If you're an information junkie, you might be better off with a ”classic“ planner or a high-tech PDA. The small size of the forms necessitates a 0.15 inch line spacing, which also seems to be a standard for small paper planners. This height is fine if you can print small and have a 0.1 to 0.3 pen, but if not, your cards might soon be a mess. Like any other system, integration is always an issue. Can you make the Hipster PDA work in conjunction with your other organizational tools, or will it be just another alluring productivity distraction? Paper cuts. Clumsy people should also carry a few band-aids. This is just a summary of what I personally find to be the upsides and downsides of working with the Hipster PDA version of the D*I*Y Planner; your mileage will vary wildly. Whatever the case, I still believe it's a great option for experimentation, and I'm going to make the Hipster PDA a permanent part of my own kit. Just a final note: both the regular 'Planner and Hipster PDA kits were influenced by hundreds of requests, questions, comments and complaints from users, readers, and especially the members of the 43 Folders Google Group. My deepest thanks and appreciation goes out to these people: you've helped shape this product, and deserve much of the credit. Hopefully, it reflects far different and wider needs than my own; this, I think, will be the key to any success.